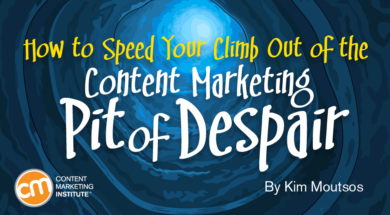 Still feeling frustrated by your content marketing program? Trust me, you’re not alone. 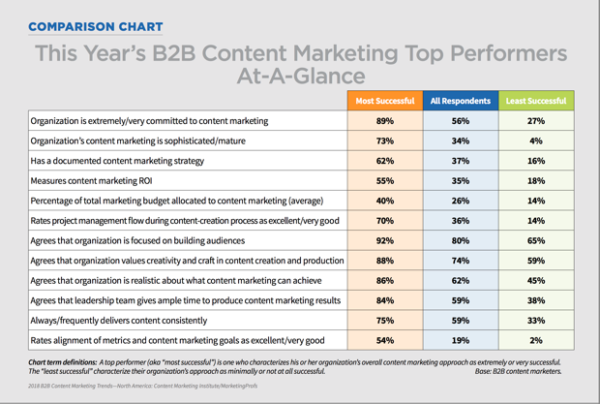 Yes, nearly 65% of B2B marketers report they’re having more success with content marketing this year compared with last, according to the latest CMI research. Taken with last year’s similar result, that’s a positive trend. But let’s take a moment to acknowledge the 35% who haven’t gotten there yet. And to admit that “more success” doesn’t mean our collective frustration is resolved. 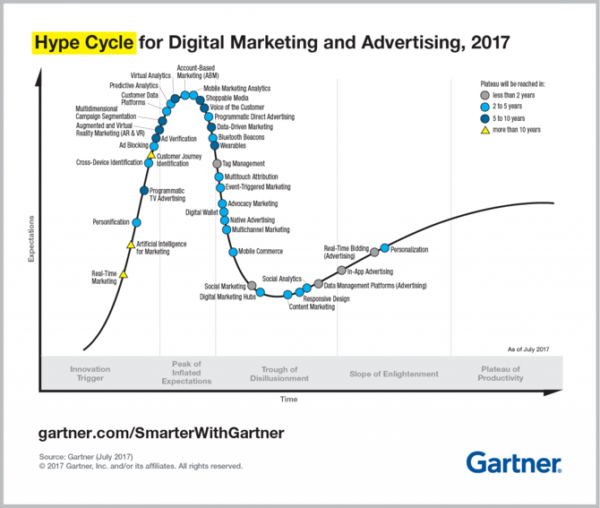 Look at where content marketing sits in the latest Gartner Hype Cycle – pretty much as close to the bottom of that trough of disillusionment as you can get. CMI founder Joe Pulizzi lays out what this cycle means so eloquently that I’ll simply point you to his explanation. Being at the bottom of this trough isn’t so bad. It simply means the content marketing industry has passed both the inflated-expectations and the punctured-expectations phases. Brands are finally realizing that great content has to be integrated into every part of their marketing and communications strategy. And as a result, what those brands need to run a successful content program has drastically changed. In fact, if your organization’s perception of content marketing is flirting with disillusionment, getting the right people involved can speed the climb to enlightenment. After all, it may not be The Princess Bride’s Pit of Despair, but no one wants to stay there too long. I’m certainly not alone in thinking that content marketing takes a village. In a recent CMI webinar, B2B Marketing Academy co-founder Peg Miller mentions that key differences between successful and less successful content marketers revolve around a cross-organizational commitment. Getting the whole company involved matters because it lets content marketing programs scale. “Use your sales team and your post-sales team as idea (generators), a distribution channel, and advocates inside the organization,” she advises. Getting the attention of busy (and skeptical) sales teams always takes effort (and, often, executive support). But it’s essential, says Marcus Sheridan. He should know. After rising to content marketing fame for using a blog to save his pool business (during a recession no less), Marcus created The Sales Lion to teach organizations how to overcome their sales and marketing challenges. At his Content Marketing World presentation this year, he told a packed room that no content marketing program should launch before the sales team is completely briefed (and won over). How are we, as an organization, going to make it work? Why does it matter to me as a sales person for this organization? If you’ve already started your program and your sales team still doesn’t know these answers? After all, people won’t support what they don’t understand. Once everyone’s up to speed, your next task is to involve the broader team in the content creation process, so they’re invested in its success. To make this work with busy salespeople, you’ve got to make it dead simple for them to take part. One way to make it easy, Peg Miller suggests, is to play the journalist. Interview a salesperson about questions their prospects often ask. Then distill the ideas into the format that suits your audience. Writers are the rarest (Marcus estimates less than 5% are good). Salespeople tend to make great video subjects or interviewees (actors). But that doesn’t mean you won’t find great writers, talkers (who make great interviewees even if they’re not comfortable on camera) or questioners (who excel at probing the audience for insights) on the sales team. That’s why you should avoid shoehorning people into the category you think is best. Instead, let people choose what makes them comfortable. How do you do this? Once you’ve created the content that answers the questions people regularly ask your sales team, make sure the sales team knows the content is ready. If you followed Marcus’s advice to get the sales team onboard before you even start, they’ll know how to use it. But it doesn’t hurt to remind them, especially in the beginning. Sharing helpful information – whether or not they’re directly featured – is a great way for salespeople to get potential customers’ attention. It’s a win-win. When you co-create content with people, they’re more likely to use it. And when using it generates wins for them, they’ll become your evangelists. Of course, the more you can tie your content marketing metrics to business goals, the more support you’ll find. But don’t let a lack of metrics stop you. If a salesperson gets a win from the content they helped produce or distribute, make sure to share the news (and the credit) across the company, Peg advises. “Raise awareness and knowledge and people will sign up to help you,” she says. And that kind of help makes your uphill journey that much faster. To help your sales team master content marketing, you should master it too. If you’re in or near Boston, Washington D.C., New York, Seattle, San Francisco, Chicago, Atlanta or Austin, make plans to attend a CMI Master Class with Joe Pulizzi and Robert Rose. Sign up today.